The real estate sector has being facing a slump along with the overall economy. But it seems the luxury segment has been able to avoid the downturn. More and more Indians are getting attracted to luxury. Housing is no exception. That's why developers are launching projects with world-class designs and amenities. These include apartments, penthouses, villas and bungalows in gated communities, besides branded residences and golf townships. The real estate sector has being facing a slump along with the overall economy. The reason is low demand due to high prices and interest rates . There is a huge pile-up of inventory, especially in big cities such as Delhi-NCR and Mumbai Metropolitan Region (MMR). But it seems the luxury segment has been able to avoid the downturn. Key luxury housing markets have witnessed steady appreciation in prices over the last few quarters. "The global real estate market has been facing turbulence for the last couple of years. India also felt the impact. But because of strong fundamentals of the economy here, confidence in the country's luxury real estate market was not shaken," says Ajay Aggarwal, managing director, Microtek Infrastructures. Om Ahuja, CEO, Residential Services, JLL India, says, "The growth in luxury segment in Mumbai, Bangalore and Gurgaon has surpassed the 2008 levels. 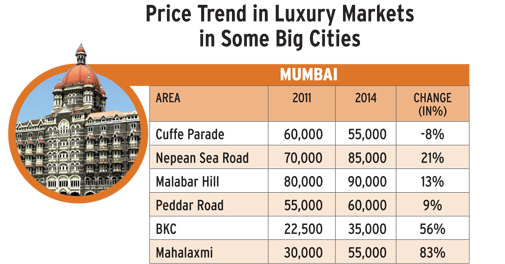 Mumbai's luxury market is seeing annual price rise of 30-40%. This figure is 30% for Bangalore and 20-25% for Gurgaon." However, prices in Pune and Noida have been stagnant, he adds. Take a look at some posh areas in big cities. In New Delhi, between 2011 and 2014, prices in the Shantiniketan area have gone up from Rs 5 lakh per square yard to Rs 9 lakh per square yard, a rise of 80% in absolute terms. In Mumbai's Bandra Kurla Complex, the rise has been 56%. "Credibility of the developer and location are the two prime considerations for buyers. Due to limited availability in prime locations of main cities, these projects tend to give superior returns even when demand is not very good. 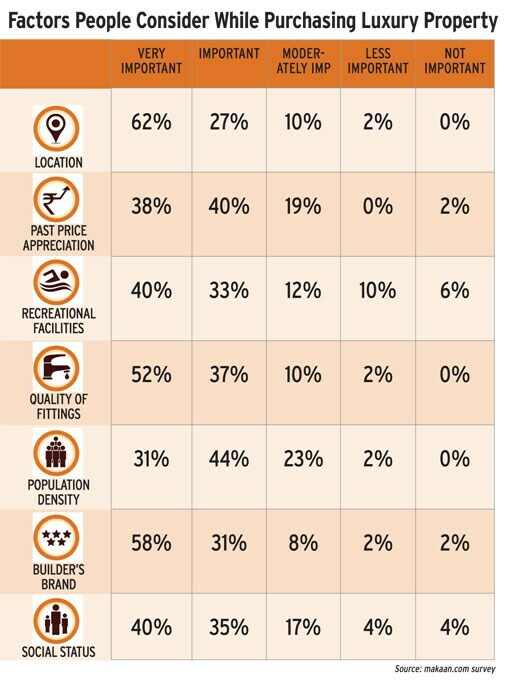 In a given location, luxury properties offered by reputed and trusted developers tend to appreciate more," says Aditya Verma, CEO, makaan.com. But some markets have seen a drop in prices also. For instance, prices in Mumbai's Cuffe Parade fell from Rs 60,000 per sq ft to Rs 55,000 per sq ft between 2011 and 2014. As per a report by Ernst & Young and Kotak Wealth Management, the number of ultra high net worth individuals in India, which was 1,17,000 in 2013-14, is projected to nearly triple to 3,43,000 by 2018-19. As per a KPMG report, "Luxury is the fastest growing segment in residential housing. Between 2008 and 2012, about 182 luxury projects housing 25,570 units with a value of $30 billion were launched in top seven cities. Many were absorbed, fuelled by strong growth in the number of high net worth individuals." Experts say those who buy luxury houses usually don't take loans for the purchase and that's the reason why high interest rates don't have much impact on demand in this segment. "People in high income groups who finance the purchase from own resources are more or less ready to buy even at higher prices," says Anil Tayal, CEO, Informage Realty Pvt. Ltd. Traditionally luxury meant prime location and good social infrastructure and amenities. Now, it is not limited to swimming pool and club in the society. Builders, in order to stand out in the market, are bringing in new technologies, impressive designs and latest architecture. They are also collaborating with internationally acclaimed architects and designers. For example, Paras Buildtech has collaborated with Warner Wong Design and Wow Architects of Singapore for architecture and Cracknell for landscaping at its Paras Quartier project in Gurgoan. Experts are optimistic about demand for luxury housing in view of the country's high rate of economic growth. "With Indian economy slated to grow at 6% next year and 6.5% in 2016-17, it is reasonable to assume decent wealth creation over the next decade. People spend more on luxury products if they are sure of their future earning potential. We believe luxury housing growth in India will outpace GDP growth by two times" says Verma of makaan.com. "High economic growth leads to rise in demand for luxury real estate. India is thus at an advantageous position. Investors, too, are willing to pump in funds. With active push from the government (which plans to build smart cities), the market has to perform," says Aman Nagar, director, Paras Buildtech. Gurgaon: This suburb of New Delhi is home to a number of big companies and their executives. This has fuelled demand for luxury houses. The most sought-after destinations are Golf Course and Golf Course Extension roads. The upcoming destinations are New Gurgaon and Sohna road. Mumbai: India's financial capital has been the prime market for luxury houses. It also commands a premium over other metro cities. Areas like Mahalakshmi have surprised with the pace of price appreciation. It was not among the prime locations some time back. Other areas which have seen good growth are Bandra West and East. Bengaluru: The city is the hub of India's information technology industry, whose executives are the main buyers of luxury houses here. The cosmopolitan culture attracts many people to the city. Apart from this, the difference in prices with Delhi and Mumbai is a huge motivator. In Bengaluru, areas like Whitefield and North Bengaluru have seen good growth. Hyderabad: The appreciation in the past six months after the political turmoil settled has been dramatic and has surprised everybody, says Ahuja of JLL India. Banjara Hills has seen good price appreciation in the luxury segment, he says. Kolkata: EN bypass has done well in the recent past. South of EM Bypass saw growth of 90% in absolute terms between 2011 and 2014. EM Bypass runs along the eastern rim of the city and provides easy access to locations in south and central Kolkata.